Deno's Wonder Wheel was built in 1920 by the Eccentric Ferris Wheel Company. As the builder's name implies, this is not your average Ferris Wheel. As the Wonder Wheel rotates, the majority of the cars actually move back and forth slowly along tracks between a larger outer wheel and a smaller inner wheel. Ask to ride one of the moving cars. If you're afraid of heights, this is an experience you're going to remember for a while. Trust me. 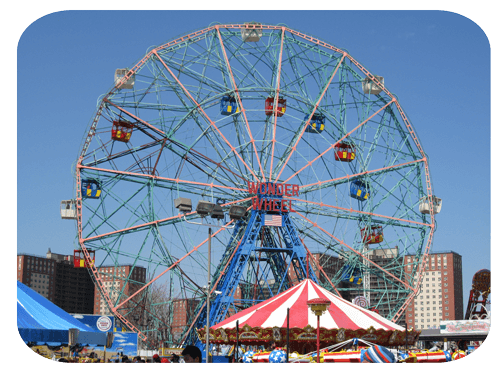 The Wonder Wheel epitomizes the entrepreneurial spirit and engineering innovation that went into designing outlandish rides from the 1890s through the start of the Great Depression in 1929. Designing a hit ride was like designing a popular phone app today - you could strike it rich, so a lot of people tried it. The Wonder Wheel's inventor claimed the ride combined the best features of the traditional Ferris Wheel and really slow-moving roller coasters called scenic railways. The Wonder Wheel was, in a sense, a last hurrah for each type of ride. "Airships" (blimps) came to replace Ferris Wheels as a way to see panoramic views from high altitudes, and fast and safe roller coasters gained favor over slower scenic railways by the late 1920s. Now, onto a crash course in Ferris wheel history so you have some sweet factoids to show off to your friends and family. The first Ferris Wheel was built by George Ferris for the Chicago World's Fair of 1893. The fair was supposed to celebrate the 400th anniversary of Columbus discovering America in 1492, but opened a year late because of construction delays. Like all good things, better late than never, right? The fair's organizers were a who's who of Chicago's wealthy business elite. At the time, Chicago was looked as a large but somewhat unsophisticated industrial city. So, the organizers set out to prove to the rest of the world - particularly those pesky New Yorkers and Parisians - that Chicago truly was a top-tier city. A contest was held for a centerpiece that would rival France's Eiffel Tower, built for the Paris World's Fair of 1889. Ferris, a civil engineer from Pittsburgh, won the contest with his design for a massive rotating metal wheel held together only by a network of thin spokes. Quite a few people refused to ride it initially because they thought there was no way it could be structurally stable. The Wonder Wheel was landmarked by NYC in 1989. And while you're waiting in line, check out Grandma's Predictions, a rare and often-overlooked 100-year old mechanical fortune telling machine. This definitely not your average Ferris Wheel. Grandmother's Predictions. A rare, working, 100-year old mechanical fortune teller.